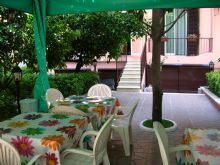 Less than 10 minutes walk from the Colosseo and Termini railway station, in a quiet and elegant area in the historical center of Rome, you find "Gioia Bed and Breakfast, where you are welcomed into a friendly and relaxing atmosphere. 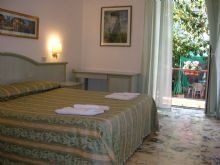 The rooms are spacious and independent and in the private garden you can have a copious and genuine italian breakfast amongst orange trees and fountains. 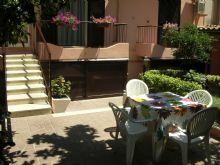 Gioia Bed & Breakfast is situated 100 mt from Metro Station MANZONI, (1 min from Termini Station) and close to numerous bus and tramway lines: within 10 min you can reach the Vatican city, the Spanish steps, the pittoresque Piazza Campo De Fiori and the Trastevere district. If you prefer to walk, Colosseum and Roman Forum is only a 10 minutes walk away, Venice Square and the Trevi Fountain can be reached within 10 minutes. 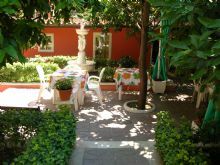 In the summer you can have your breakfast in the open, surrounded by the orange plants. In winter The abundant quality breakfasts are served in the Breakfast Room. Near COLISEUM - BETWEEN TERMINI RAILWAY STATION AND SAN GIOVANNI CATHEDRAL. 100 MT FROM METRO STATION MANZONI. If you need to cancel your reservation, please do it by email (not by phone) at least 2 full days before your arrival date, otherwise B&B will have to take the amount of the first night from your credit card (No Show). 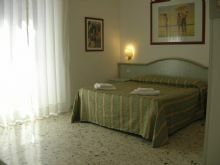 Address: Via Vittorio Amedeo II, 20 - ROME Historical center, 100 mt from Metro Station "MANZONI". from (Fco) Leonardo da Vinci - Fiumicino airport, You have Leonardo Express train to Termini railway station (Every 30 minutes from 7 am to 10:40 pm at 11, 00 Euro each ticket). by Underground , 1 min: Metro A Line direction "Anagnina", the stop station is "Manzoni". From metro stop follow via San Quintino for 100 meters; The first street on the left is Via Vittorio Amedeo II.